There is only so much doom and misfortune a person can take--even in a Coen Brothers movie. We can’t know what really happened.… Because the more you look, the less you know. But the beauty of it is, we don't gotta know! We just gotta show that, goddamnit, they don't know. Reasonable doubt. Science. The atom. You explain it to me. Go ahead, try. At the time, this routine seemed little more than an offhanded parody of the Michael Frayn play Copenhagen, in which Heisenberg and Nils Bohr discourse windily about the inscrutability of their past actions and intents. But the idea recurs more centrally in the Coen brothers’ new film, A Serious Man, when a beleaguered physics professor named Larry Gopnik (Michael Stuhlbarg) explains to his students that the uncertainty principle “proves that we can’t ever know what’s going on.” In this case, it is far less clear whether the assertion is intended as satire or corroboration of Frayn’s metaphor. Indeed, the movie itself is similarly difficult to pin down: part tragedy, part epistemological inquiry, part Jewish comedy of manners. The film opens with a prologue, a 19th century ghost story set in Eastern Poland. A poor Jewish farmer returning home to his wife one wintry night brings with him an old traveler who may or may not be a dybbuk--the soul of a dead man sent back from Hell. The scene, played entirely in Yiddish, has no direct connection to what follows and might easily be considered an idle flourish. But it succeeds in establishing the aura of doom--unforeseen but inexorable, deaf to entreaty--that permeates what follows. But for Larry, nothing does give. Rather, the screws tighten, incident by incident--a car accident, an unanticipated funeral, an escalating series of legal transgressions committed by his brother. Larry seeks the counsel of a series of rabbis, but to little end: One advises him to witness evidence of the divine in a parking lot; another tells a fable with no moral; a third won’t speak to him at all. His quest for meaning, for some explanation of what is happening to him and what he might do about it, is a journey down an endless hallway of closed doors. A Serious Man is the Coens’ most autobiographical film to date, and their most emphatically, if not always flatteringly, Jewish. The ethnic landscape they portray is so uniform that the few goyim in the film are presented as dangerous exotics, forever playing ball and hunting deer. There’s a strong whiff of Woody Allen to this cultural contrast (think the split-screen family dinners in Annie Hall), though filtered through the darker lens of the Coens’ vision. It may not be an accident that the actor who plays Larry’s truant son, Aaron Wolff, could easily pass for one of the young, red-headed Allen stand-ins who populated the director’s earlier films. Of the Coens’ own oeuvre, the film it resembles most closely is, again, The Man Who Wasn’t There, a title that would have suited this film equally well. Larry is a passive figure, a glider on turbulent currents he cannot predict or comprehend. His primary act of will in the course of the film is the decision to seek advice--that is, the decision not to decide, to wait for a greater authority in this world or the next to tell him what to do. 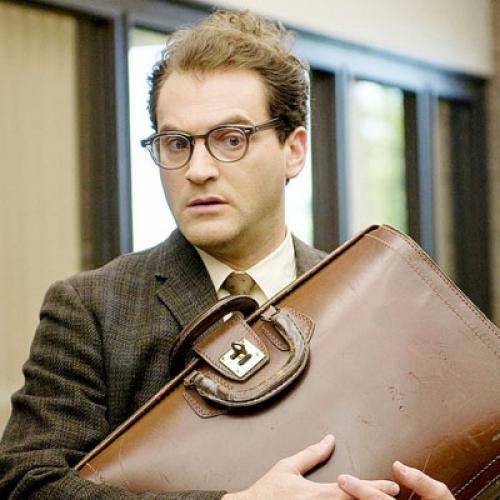 Stuhlbarg, an accomplished stage performer in his first starring film role, does what he can with the character, but the role is an inherently limited one, a center that isn’t really intended to hold. The primary suspense of the performance is whether, and when, Larry’s constant state of nervous puzzlement and despair will give way to something more assertive, more cinematic. The film is often quite funny, especially when it casts a knowing eye on the rituals of middle-class Jewish suburbanhood at the very moment when they were about to have the generational rug pulled out from under them. (It is no coincidence that the movie is set at the time when Joel and Ethan were themselves coming of age.) And there are moments of genuine tenderness as well. But humor and empathy alike have trouble flourishing in the grim narrative soil the Coens provide, in which every cosmic joke is a black one. As Ethan explained in an interview, “For us, the fun was inventing new ways to torment Larry.” Over time, though, the fun becomes theirs alone. The game is too apparent and, for all the Coens’ craftsmanship, the accumulation of insults becomes deadening. It’s possible to maintain such a delicate balance between tragedy and comedy, as the Coens demonstrated in their previous film, the bleak, disorienting Burn After Reading. But in A Serious Man the humor is broader and more familiar: the Jewish self-deprecation, the suburbs-as-purgatory motif. Here, too, one sees the directors’ hands moving behind the curtain a little too clearly: in the repeated red herrings where a scene builds to violent climax only to be revealed as a dream; in not one but two sudden deaths, the second played for laughs; in the strained gag presented when the wizened old rabbi finally deigns to speak. Taken together with No Country for Old Men and Burn After Reading, A Serious Man confirms a new phase for the Coens, darker and more probing than the easy farce that had characterized their work earlier in the decade (O Brother Where Art Thou, Intolerable Cruelty, The Ladykillers). The universe they are now navigating is one of godlessness and capricious misfortune, in which no one is watching over us unless by CIA spy satellite. Despite its flaws, A Serious Man is interesting for what it adds to that vision, and for what it reveals, or pretends to reveal, of the milieu that shaped the Coens themselves. Taken on its own, though, it is a frustrating film, a tease--and the fact that this is by design is little consolation. In one of his sessions with an unhelpful rabbi, Larry pleads, “Why does God make us feel the questions, if he’s not going to give us any answers?” After watching A Serious Man, one might be forgiven for posing the same query to the Coens.